Peppermint is perhaps most commonly known for its use as a flavouring, being often found in toothpastes, mouthwashes, medicines and sweets. The sharp, distinctive flavour and fragrance of peppermint comes from the volatile oils it contains, these are also responsible for the therapeutic action of the herb. 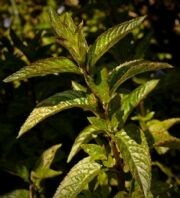 Many may have at times used a cup of peppermint tea to aid digestion, and this is one of the main uses of this herb. Studies have shown that peppermint oil has the ability to relax the muscles in the gut and may provide relief to symptoms of Irritable Bowel Syndrome (IBS). Peppermint is also well known as a decongestant, and Menthol, a component of Peppermint oil is a common ingredient in various lozenges. However most of these contain synthetically made menthol, as opposed to that which is derived from Peppermint. Peppermint Oil, and the Menthol it contains, also has a cooling action when applied topically or when it comes into contact with the mouth or throat. Interestingly, this is because of an effect it has on the nerves, rather than actually affecting the temperature of the area in contact. This is the sensation experienced when using a mouthwash or toothpaste containing peppermint.